With the summer season nearly upon us, a lot of people are excited about getting out and cooking on the grill. 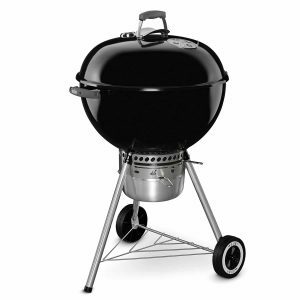 If you are looking for a new charcoal grill, it can be a difficult task as there are thousands of products available. 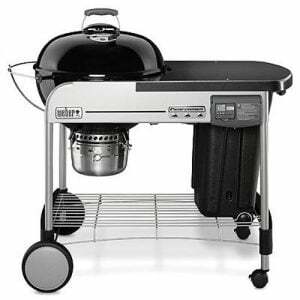 Charcoal grills are fairly inexpensive when compared to gas grills due to the fact they have a lot less moving parts. The best charcoal grill should be versatile and allow you to cook in multiple ways. This means being able to sear, roast and smoke your foods depending on what you are cooking. Of course, they also require somewhat more skill when compared to cooking on a gas grill as you have to actual work to control and maintain the temperature and airflow instead of using a knob or dial. You are also more likely to get dirtier using a charcoal grill because you have to clean the ash frequently; something not needed with a gas grill. You can read more about the pros and cons of charcoal vs. gas grills here. You don’t need much to sear on a charcoal grill. All that is really needed is a charcoal tray and grilling grate. But for actual quality cooking, it gets a bit trickier. A heavy-duty fire box, a tight sealing lid, and overall build are needed to help prevent air from leaking in. Adjustable dampers (air vents) for oxygen control are some of the key things to look for as well. Being able to set the grill up for 2-zone cooking is another must have if you plan on cooking more than just burgers and dogs. Lastly, a grill that is designed for easy ash removal and clear access to charcoal saves a lot of time and headache. Today we will be looking at 10 of the best charcoal grills and what they have to offer. I also added a bonus 11th best charcoal grill in the premium category that I think is worth looking into. 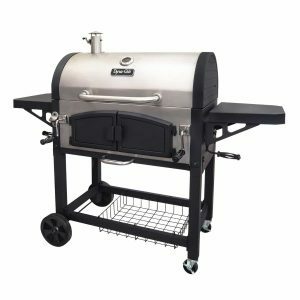 My goal was to select top rated charcoal grills that covered a variety of prices, hoping to provide you with an excellent option for whatever you can afford. I think that each of these selections is the top values in each price range. The thumbnail reviews of my top 10 list are in order of current list price from lowest to highest. Prices may change over time. Regardless of the price range, you fall under, the internal temperature gauge thermometers built into the hoods of grills are mostly low quality and inaccurate. They are routinely off by as much as 50°F. That is why I always recommend a good digital meat thermometer that includes a probe that can be placed on the cooking surface for accurate temperature readings. The first charcoal grill we will be looking at is the Char-Griller 1515 Patio Pro Charcoal Grill, and my choice for the best small charcoal grill. This grill is perfect for small families, apartment dwellers, students and budget-conscious folks. The Char-Griller company sells grills that simply deliver a great grilling experience at a fair price. The Char-Griller Patio Pro is the cheapest available to you from this list. I wanted to give you a wide range of options from which to choose, depending on how much money you want to spend. This model is the best charcoal grill for you if you are on a budget or have limited space. 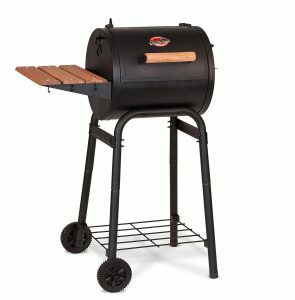 The Patio Pro comes with Char-Grills unique charcoal barrel-style grill design. It features 250 square inches of cooking space. It is made from heavy steel construction and is powder coated to increase durability. The cooking grate included with it is true cast iron able to provide wonderful sear marks. With a double steel bottom and a side air vent for controlling airflow, this baby can bring the heat. There is also a stay cool wood handle and a side shelf for holding useful tools. Two durable plastic side wheels make it easy to move the grill around the patio. An easy dump ash pan for quick and easy ash disposal round out this grill. 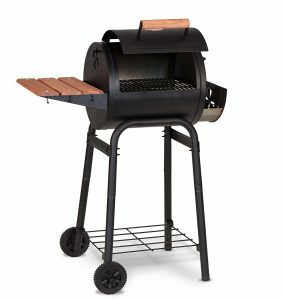 Weighing in at only 50 pounds, 31 inches wide by 21 inches deep and standing at 44 inches in height, this grill is perfect for small spaces. The second grill up for review is the Char-Broil Kettleman TRU-Infrared 22.5″ Charcoal Grill and my choice for the best infrared charcoal grill. Char-Broil is a true innovator in the gas and charcoal arena offering low costs designs that are durable and built to last. As the second cheapest grill on this list, the Kettleman is a true bargain. The Char-Broil Kettleman TRU-Infrared 22.5 is intended to go head to head with Weber and their Original Kettle 22-Inch charcoal grill and they sure gave it a good run for their money. Being slightly cheaper and offering just a little more, Char-Grill is putting up a good fight with the Kettleman. While it falls just short of knocking Weber of off its throne, the Kettleman does just what it promises. The Char-Broil Kettleman TRU-Infrared 22.5″ charcoal grill provides a unique and very forgiving cooking experience. This is due to its TRU-Infrared cooking system that helps prevent hot and cold spots on the grilling surface and provides faster cooking with less fuel consumption. The Infrared grates help spread heat evenly across the surface. They also prevent flare-ups by creating a barrier between the food and flames. The No-Fall-Through cooking grate is a porcelain coated rust resistant cooking grate that keeps even the smallest foods from falling into the fire. The Kettleman comes with a hinged lid with mounted temperature gauge that every Weber user has wished for at least once. The removable ash bowl designed for simple clean-up is another convenience included on this grill. This charcoal kettle grill has a 360- square inch total cooking surface. It is 25.8-inches long x 25.8-inches wide x 38.8-inches high. It comes with a 10-year limited warranty. Bottom vents do not close so it is harder to shut this grill down. The third grill up for review is the Weber 741001 Original Kettle 22-Inch Charcoal Grill, another one of the best charcoal grills. 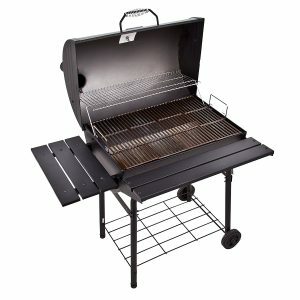 This is my choice for the best inexpensive charcoal grill. Yes, we finally have a Weber product on this list, and there is a significant reason for that. Everyone knows Weber is the primary company you go to if you are looking for a charcoal grill. This model is the best charcoal grill you can buy for under $100. This comes with a kettle grill that has 363 square inches of cooking space. The cooking grate included with it is plated steel and measures 22” in diameter. To keep rust away, the vents are rust resistant and durable. The bowl and lid are made from steel and coated with enameled porcelain, and the lid has glass-reinforced nylon handles for easy holding. Both the lid and body are made from solid metal sheets so there are no welds to wear or rust. As with all the Weber product on this list, this one comes with their standard “One-Touch” cleaning system and an ash catcher, both made entirely of aluminum so they are strong and durable. When built, the entire grill measures 22” long, 25” wide and 38 ½” high. It comes with a 10-year limited warranty. The next product is the Char-Broil American Gourmet 800 Series Charcoal Grill. Are you surprised the next best charcoal grill is not another Weber? Char-Broil is another fantastic company to buy grills from. They make high-end products that are durable, so you know they are going to last a long time. This specific model is another well-made and budget friendly grill, making it affordable and a great buy. The Char-Broil American Gourmet 800 Series Charcoal Grill has a large area to cook on measuring 840 square inches for the entire cooking area. There is also 272 square inches of chrome plated swing-away warming shelf space to cook more things. The cast-iron grates are 568 square inches, letting you barbecue up to 20 burgers at once, perfect for large parties and summer get-togethers. 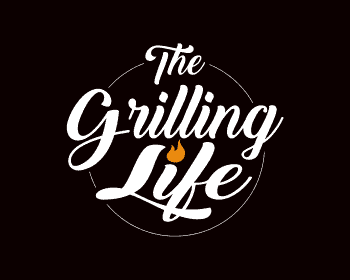 The grill is equipped with a bunch of dampers, and the fire grate can be adjusted for height, making it simple to control smoke and increase or decrease heat. A temperature gauge has been equipped with the hood, so you can monitor the heat at all times to make sure your food is cooking at the perfect temperature. It comes with a front shelf, three tool hooks and two folding side shelves for ingredients, making it the ultimate tool for a summer grill master. Yes, another Weber product, and for good reason at that. This is my choice for the best bang for the buck charcoal grill on this list. This grill is a great buy for most people, being one of the most user-friendly, most versatile and one of the best performing grills out there. With over 65 years of experience, Weber just does a better job than most and it’s hard to beat their customer service. Weber grills cook awesomely and have many features that are smart, useful and easy to use. Even in the ever increasingly crowded marketplace, most shoppers are still willing to play more for the Weber brand and are rarely if ever disappointed. 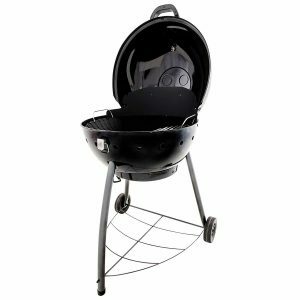 The Weber Original Kettle Premium 22″ Charcoal Grill is the same style kettle body as the Original Kettle 22″. The differences are; instead of several slots underneath for ash to fall through onto an open tray; the Premium comes with an enclosed ash catcher attached to the bottom of the body so they do not blow around. The catcher can be removed easily for quick disposal of ash. The premium also includes a lid mounted thermometer and hinged cooking grates for easy coal replenishing without having to remove the food. The premium also comes with nylon handles that protects nicely against the heat. The side handle has convenient tool hooks attached for hanging equipment. The premium comes in crimson, black, green or copper. This Weber is durable and can easily cook using any style from searing and general cooking to 2-zone roasting the slow and low way. This the first Napoleon Charcoal grill on our list today but it will not be our last. Napoleon is Canada’s answer to the Weber and they are really starting to give them a run for their money offering a viable alternative in the kettle grill arena. Napoleon offers great quality products with enough distinctive features and ideas to make them stand out. Along with outstanding customer support, Napoleon is a brand to keep on your radar. The Napoleon NK22CK-L Charcoal Kettle Grill is built with an extra thick porcelain-enameled bowl and lid and features 365 square inches of cooking space. It has hinged chrome steel rod grates that are ideal for adding charcoal while cooking. They are also adjustable to three different heights for indirect or direct heat grilling. 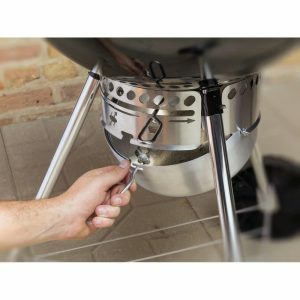 An interesting feature Napoleon added is a stainless steel heat diffuser that can be inserted into the bottom of the bowl of the grill that helps displace heat from the charcoal throughout the cooking chamber for low and slow cooking. It can be removed to dial up the temperature for high heat grilling. To control the airflow, there are two stainless steel air vents on the bottom and a corrosion resistant vent topside on the lid. It also includes an Accu-Probe temperature gauge. Like Weber, the Napoleon also comes with a removable high capacity, steel ash catcher for easy disposal. A fourth leg was added for extra stability and all-weather wheels complete the package. The next grill on our list comes from Dyna-Glo and is the Dyna-Glo DGN576SNC-D Dual Zone Premium Charcoal Grill. This is my choice for the best charcoal grill with cooking flexibility. This is because of its ability to easily provide dual zone grilling. Dyna-Glo builds grills that are durable and are highly functional centerpieces that family and friends will want to gather around for years to come. 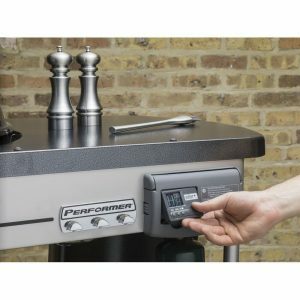 The ability to adjust various charcoal trays separately with the tray adjustment cranks allows you to customize temperatures across the cooking area to cook different types of foods at varying heats. This flexibility is great not only for small or large get-togethers; it is also perfect for cooking multiple foods at the same time. This type of heat control is usually reserved for gas grills, but now with the added benefit of charcoal flavor. 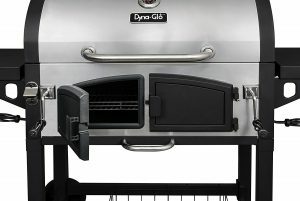 The Dyna-Glo Dual Zone Premium Charcoal Grill comes with porcelain-enameled, cast iron grates that maximize searing and heat transfer across the grill’s lofty 816 square inches of cooking space. You can easily create a dual zone cooking area with the removable steel firebox divider. The stainless steel lid with double-walled liner and stainless steel smoke stack with adjustable flu cap are durable for longevity. This Dyna-Glo features a removable high capacity ash pan for easy ash clean up. Heavy-duty casters and wheels provide mobility and the heavy-duty steel body construction will keep your grill going strong for years to come. Another solid contender for best charcoal grill 2017 comes from Portable Kitchen and is the PK Cast Aluminum Grill. Portable Kitchen Grills came to life in Texas around the same time as Weber in 1952. The classic original, rust-proof aluminum bodies just refuse to go away and has kept the PK name and grills alive. Many of these grills have been passed down from generation to generation and are still going strong today. These super elegant throwbacks reproduced from the original 1952 design are made from rugged and rustproof, cast aluminum. It features a flat style bottom that makes it simple to maneuver coals to either side for easy indirect heat cooking. There is a unique 4-way venting systems that make controlling the temperature easier than ever. It was rated as delivering the best airflow control, heat retention and temperature control of any full-size grill for 2017. 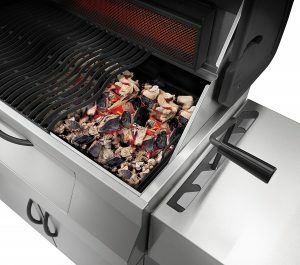 The grilling grate is 306 square inches and is hinged to easily add more coals while cooking. This grill provides excellent performance for cooking both hot and fast, or low and slow smoking. Semi-pneumatic rubber wheels that are durable make moving this grill around the yard easy and convenient. Aluminum bottom and side trays provide plenty of room for holding utensils, food, and condiments. The easily assembled grill measures 35 inches long, 16 1/2 inches wide, and 35 inches high. The cooking section detaches from the lightweight aluminum carriage, making the entire unit easily mobile for your next camping trip. These grills will last forever. 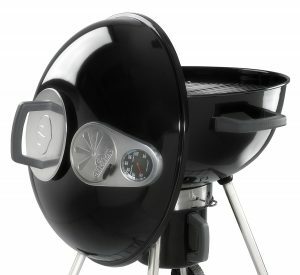 The last Weber charcoal grill we will be looking at on this list is the Weber 15501001 Performer Deluxe Charcoal Grill. 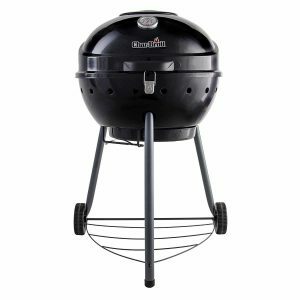 No top charcoal grill list would be complete without several Weber products; as they are one of the most well-known manufacturers of grills on the market today. Weber is known for creating high-quality products at affordable prices, along with a great customer service in case anything goes wrong. Now, this is one of the more expensive charcoal grills on the list today, and with that comes a more vigorous review process. I wanted to make sure the Weber Deluxe Charcoal Grill offers more features. Especially since it comes with a heftier price tag. Even though it is one of the priciest on this list, when compared to other charcoal grills, it is still a very affordable option if you are looking on the cheaper side. The Weber 15501001 Performer Deluxe Charcoal Grill has a lot of features to make it to this list for being the best charcoal grill. First off, the bowl and lid are enameled with porcelain and measures 22” in diameter. However, the actual cooking area itself measures 363 square inches. It is very easy to light, as it has Weber’s standard electronic “Touch-N-Go” gas system. It can be very difficult to clean a charcoal grill, but this Weber product is equipped with the One- Touch cleaning system that is made of aluminum steel, and an ash catcher that is removable and can hold a lot. Along with the grill, it comes with an LCD cooking timer that can be removed, and the lid has a built-in thermometer for keeping track of the internal temperature. Once assembled, this grill measures 43.5” by 48” by 30”. The next to last charcoal grill on this list today is another from Napoleon and is the Napoleon NK22CK-C Charcoal Kettle Grill. 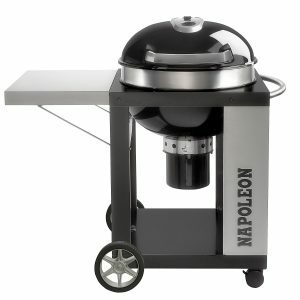 Napoleon grills are very comparable to Weber charcoal grills when it comes to quality and performance. Napoleon has the unique ability to load their grills with extra features without overcomplicating them. These extras make the increased price well worth it. The Napoleon NK22CK-C Charcoal Kettle Grill comes with their signature style heavy-duty cast iron cooking grate that can be adjusted into three height positions for better heat control. It is also hinged allow easy access to the fire. Another cool feature is the hinged lid with a handle that can spin in a rotary motion up to 180 degrees. 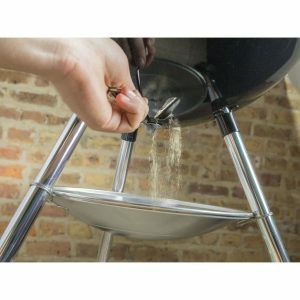 Included are a removable stainless steel heat diffuser and stainless steel charcoal baskets, which are great for indirect cooking. 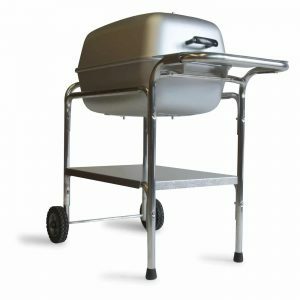 This grill also comes with a detachable ash catcher for easy cleanup and a full cart set up with a folding side table. The vents can be closed making it easy to shut the grill down saving charcoal. The grill is on the heavier side due to its solid heavy-duty construction making it built to last. This bonus entry from Napoleon is my choice for the best premium charcoal grill. While trying to cover all price ranges, I wanted to offer as my last listing a premium grill offering. Considering the steep price tag, most of us will only be able to stare and dream about owning this grill. 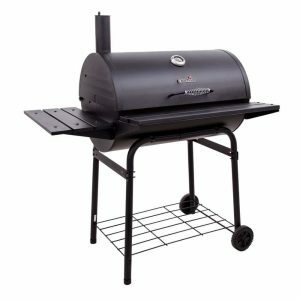 But if the Napoleon PRO605CSS charcoal grill, is in your budget, you may want to take a closer look. With three grills making the Best Charcoal Grill 2017 list, Napoleon is a brand that is worth taking notice of. If you are an adamant charcoal user but love the look of your neighbors polished gas grill, the Napoleon PRO605CSS may be the ticket for you. A charcoal grill in the style of a premium gas grill, it has the look and feel of both worlds. 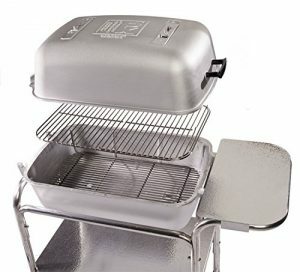 This is a beautiful and durable 304 stainless steel cooker, making it quite unique in the charcoal grill arena. The Napoleon PRO605 grill has 605 square inches of main cooking area and 240 square inches of warming rack area for a total of 845 square inches of cooking space. The porcelain coated cast iron wave cooking grates retain heat efficiently and create unique and perfect sear marks on your food. 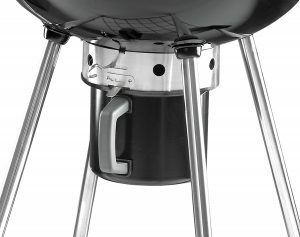 The grill features an adjustable full-width charcoal grate and a front door for loading and stirring charcoal so you will never have to move your food during a long cook. Included charcoal dividers allow you to sear with direct heat, or cook low and slow with indirect heat. Adjustable air vents allow you to control the airflow and temperature. The double lined hood offers a tight seal, which is a nice feature to help keep the heat in. An Accu-Probe temperature gauge helps you keep an eye on what’s going on under the hood. An ash and drip pan slide out for easy cleanup. The stainless steel cart includes two wrap around grill shelves, tool hooks, and condiment trays. Double door storage, lighting lamp, and locking casters round out this grill. I saved this last feature for the end, as it is unique to a charcoal grill. There is an included rotisserie burner powered by charcoal for roasting. A special vertical charcoal hopper in the back just for the rotisserie powers it. Charcoal grills require regular maintenance and cleaning to make sure they function properly and cook your food well. They should be cleaned at the start of every grilling season and a couple of times in between. Without regular cleaning, carbon and ash can build up as well as rust. Lids: Brush the lid with a stainless steel brush to remove buildup. Wipe down with a mild soap and water while the grill is warm (not hot). Bowl: Remove all excess ash and debris out of the charcoal grate and bowl. Using a steel wool pad, clean remaining build up with a mild dish soap and water. Cooking Grates: Preheat the grill at high temperature for 10-15 minutes. Using a grill brush, remove any leftover residue on the grates. Finish by applying a light coating of vegetable oil to help prevent sticking and rust. Following each use of the grill, clean the grates with a brush to remove leftover stuck on food and grease. Outside: When the outside surface is cool enough to touch, use a mild dish detergent soap to wipe down the bowl and lid. Regular cleaning will greatly increase the life of you grill parts. I recommend a good Charcoal Chimney Starter for an easy, no hassle and chemical free charcoal lighting option. You can also read my charcoal lighting techniques guide for some great options. I suggest going with anything that is made from all natural hardwood and is completely chemical free. There are a lot of options to choose from, but Kingsford Charcoal Briquettes are always a good choice to start with. They are a known and trusted brand. A grill brush, steel wool and soap and water will do the trick. Another good option is a grill cleaning spray that is made specifically for cleaning grills. You can even purchase a complete Grill Cleaning Kit like this one for great results. Regularly inspect grill parts for food, ash, and carbon build up as well as rust. Keep your grill clean and seasoned. Above all, purchase a good grill cover and use it when your grill is not is use. If you are looking for the best way to cook perfectly barbecued meat and vegetables during the summertime, all of these charcoal grill options above are worth buying. 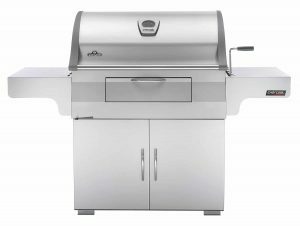 The main reasons being the way they are built, the manufacturers of each producing high quality and feature packed products while also being affordably priced grills. These are some of the best charcoal grills on the market today and are guaranteed to produce awesome results with a little practice. As always, if you or someone you know is in the market for a new charcoal grill or you find this information useful, please consider sharing it with your Grilling friends and on social media! If you would like to leave a comment or have a review of your own to share on the Best Charcoal Grill for 2017, please do so below. We always welcome your input. Patrick, I love your reviews and style. Regarding the Weber ash catcher, I would respectfully disagree with the EASE of the ash removal. One has to squeeze VERY hard 2 stiff pieces of steel for the catcher to release. A point noted in a few online blogs. I have been a Weber only guy for 30+ years; but this latest ash dump is a deal-breaker. Thus, I am looking for alternatives and stumbled onto you wonderful website! My biggest worry with gas is the inability to use wood chunks for all meats (and veggies). Do you have any tips for consideration to best replicate that flavor? I read about aluminum foil and wood chips but I would like additional “instructions” or guidance. Hi Scott. First I wanted to say thank you for the kind words and thank you for taking the time to offer your personal feedback. This is exactly the type of communication I value on this site as I think it can only help readers make informed decisions. And that is the main point of the Grilling Life site. I have been a Weber user for years as well and have had the opportunity to use or test out many of their models. While the ash catcher is very convenient in theory, you are correct in stating the release levers can be on the stiff side. As you said, you are not the first person to state this and I can only believe that Weber is aware too. I find that using a decent pair of grilling gloves can make it a little easier on the hands, but that doesn’t solve the problem entirely. In the long run, I think the benefits of a quality Weber made product outweigh the negatives by far, but I can also completely understand your decision as well. Hopefully, Weber takes note and address this inconvenience soon. As far as adding wood smoked flavor to a gas grill, there are several ways to go about it. As you mentioned, a quick and easy remedy is making an aluminum foil packet but I have had limited success with that method. Some of the new gas grills come with built-in smoker tubes or trays that are pretty cool, but these grills tend to be on the pricier side. They are worth checking out though even if it is just to dream. You can find several models with these types of options on my Top Rated Propane Grills Of 2017 guide with videos. Another cool option that I have used many times is a wood pellet smoker tube. I have had much better success using these handy little gadgets on my gas grill and even for added smoke on my pellet grill itself. Here is an example of what I am talking about: A-MAZE-N Pellet Tube Smoker 6″. Keep in mind that no matter what you use, most gas grills are not made to hold in smoke as well as a charcoal grill. It is a safety feature for gas fume buildups and therefore they just don’t seal as well as a charcoal grill. But with that said, the smoker tubes do a decent job. Let me know if you have any more questions or if I can help in any other way. I love helping as much as I love talking grilling! Love the smoke tubes you mention. Do you have a favorite pellet source? For chicken breasts and salmon, I am wondering if chips would suffice? Honestly removing the Weber ash dump hurt my hands. And grilling out 4 nights a week, we get a lot of ashes. I like the Napoleon dump a lot better – on video. Now willing to give gas a go for convenience. Can always add a charcoal option later. We are retiring to Tucson. Will certainly entertain/grill for 6+ folks, at times. That is where we need the new grill. As my 22″ Webers were fine for such occasions, I do not need a monster of a gas grill – especially if I am trying to get smoke flavor. Another question, the separate sear compartment sounds nice. But is it really needed? Seems like I could turn up the gas for 2-3 minutes for searing and then simply reduce the fire/temperature for direct and indirect grilling..? I am liking the Weber E-Spirit series. We would hook it onto a gas line. Do you have a specific recommendation? Or, any other contenders that we should consider? Thank you for the quick response, a few follow up questions…. To maximize a smokey flavor, am I correct in assuming the smaller the grill the better? As the 22″ round weber has been fine forever, Strongly considering the Weber E-300. Last question, the separate sear compartment sounds nice. But is it really needed? Seems like I could simply turn up the gas for 2-3 minutes for searing and then simply reduce the fire/temperature as needed… ?